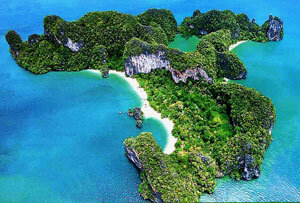 Koh Hong (Room Island) is part of a group of islands one hour north of Krabi. Koh Hong has only one beach - Pelay Beach - but it is recognized for being extremely beautiful, boasting fine white sand, coral and lots of varieties of tropical fish. Pelay Beach is framed by limestone rock formations which give it an enclosed feel. 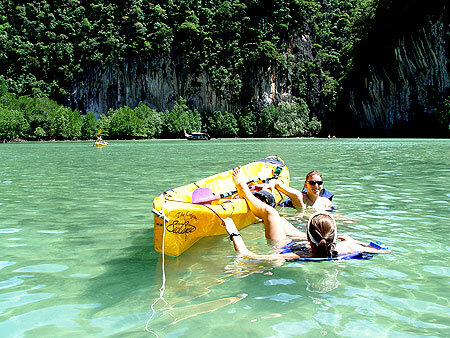 Coupled with the fact that there are seldom many people there, Koh Hong very much offers a ‘deserted island’ experience. Its name comes from an eroded group of caves in the middle of the island which harbours a large lake with a small passage to the sea. When the tide is high long tail boats are able to enter the ‘room’ and visitors can swim in around in crystal clear water with a depth of around one metre. Koh Hong is another collection point for the nests that provide the ingredients for bird’s nest soup. You can witness the fascinating sight of young men shimmying up bamboo poles to great heights to collect these nests, genuinely risking life and limb in pursuit of their income. Death and injuries do happen, so be warned! If you are on a limited time frame, a visit to Koh Hong might not be possible, but if you have the time it’s well worth the effort. A visit to the island is really getting away from it all and something you shouldn’t miss if you can avoid it! How to get there: It takes about one hour to get to Koh Island from Ao Nang Beach. Group tours can be arranged from Ao Nang. Krabi "A Day In The Islands"